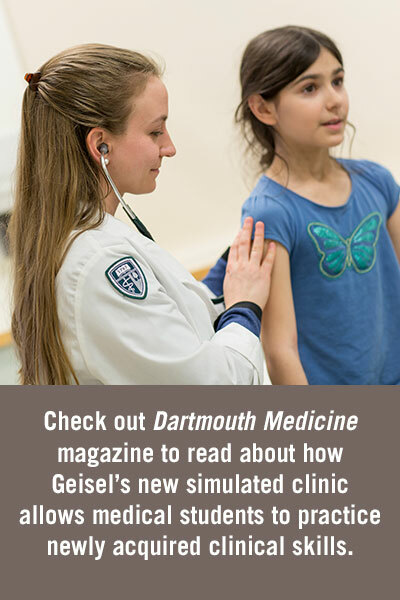 Dartmouth's Geisel School of Medicine students arrive with degrees in everything from neuroscience to English literature to music performance. Some are single, some have partners, and some are parents. About half come directly from college or graduate programs, the rest have worked as professional athletes, journalists, business entrepreneurs, you name it. Their interests in medicine are as diverse as their personal backgrounds. 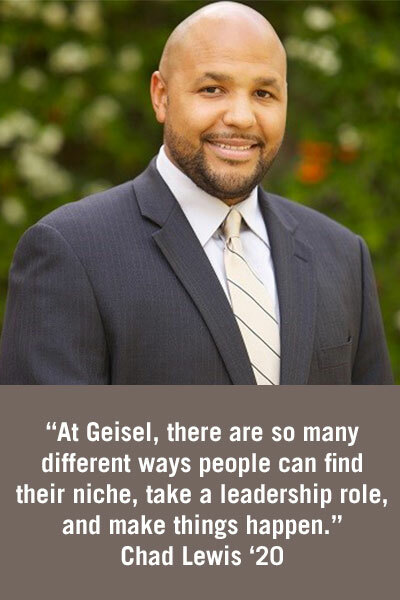 But for all of their individuality, Geisel School students share certain characteristics. They want to go places. Perhaps that's why Geisel's unique clerkship program, which encourages students to do rotations at offsite locations around the country and in different parts of the world, is particularly appealing. Geisel students also want to make a difference. Now. Not later. In fact, many students arrive with strong backgrounds in community service and activism. Here they find an environment that fully supports their efforts to participate in or launch health initiatives from the local to the international level or to volunteer in other fulfilling ways. At the Geisel School students, care deeply about their causes, their work, their patients, and each other. By all accounts, the Geisel student body is a particularly close-knit group. One reason is the smaller class size, of about 90 students. Here, no one is anonymous. Everyone is part of the peer group. As you are going through medical school, Geisel School students are the kind of classmates you can count on for inspiration and support. After medical school, they are the kind of people you can count on as lifelong friends and colleagues. Jessica Charles’ enthusiasm for exploring the world is rooted in her heritage. “Because of my background, I am very interested in exploring cultural diversity through different media,” she says. “My father is from Trinidad, which is extremely diverse with a population descended from indigenous tribes, including Arawak and Carib, African slavery, Indian indentured servitude, and Chinese immigrants all blended together.” Charles’ maternal grandparents, from the Bahamas and Barbados, are equally diverse with a blending of indigenous peoples, Brits, Scots, and Africans. Charles’ interests are as colorful as her heritage—dance, food, and learning new languages are among her passions. Self-described as somewhat intense, she is “someone who is always moving, always doing something.” As a music minor, she delved into global cultures through music, which aligned with her interest in global health, and her paternal grandmother’s practice of Chinese herbal medicine spurred Charles to travel to China to study traditional Chinese medicine. Though her appetite for varied experiences was broad, a chaotic New England childhood drove her to seek solace in her studies, eschewing the latest dance craze and other distractions that occupied her cousins. Because of her studiousness, she was able to encourage her Caribbean relatives to seek medical treatment by elucidating some of the general physiological mechanisms of disease and responses to treatment—even though they spoke English, the cultural divide was wide and they were somewhat distrustful of physicians in general. “They were more willing to trust what someone they knew did to treat their illness rather than see a physician,” she says. Well into his junior year at Western University in London, Canada, Brent Bates ’20 had an epiphany. As a captain on the varsity track and field team, Bates had helped lead Western to a national championship the year before, and had also placed sixth in the 400-meter hurdles at the 2012 Canadian Olympic Trials. But now, a knee injury had forced him to take time off from training and competing. 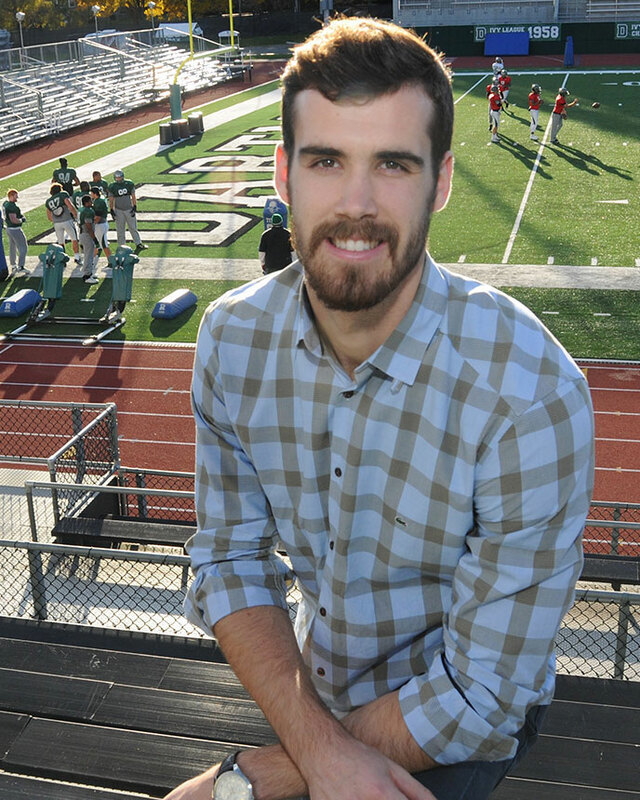 Bates’ love of sports led him to pursue an honors bachelor of science in kinesiology at Western, with an interest in becoming a physiotherapist or chiropractor. “But with the knee injury (a torn meniscus and chondral lesion of the patella), I saw a number of different specialists, including sports medicine physicians, and the more I talked with them and learned about their careers, the more intrigued I became,” he says. He found those experiences to be particularly meaningful. “I learned to interact with patients on my own, asking them about their families, their beliefs, and their thoughts about their care at St. Michael’s—some of the more personal aspects of medicine that are so important in patient care,” he says. While Bates’ graduate school experiences helped him gain acceptance to several top medical schools in both Canada and the US, he was drawn to Dartmouth’s smaller, more personal learning environment, its people, and the physical beauty of the area. In addition to keeping a busy academic schedule, he is juggling a variety of activities this semester, which include finishing a paper (based on his research) that he has been invited to submit to an international stem cell journal, working part-time at Dartmouth’s varsity strength and conditioning facility, looking into research opportunities related to orthopedic surgery at DHMC, and getting in some hikes and late-season kayaking with his classmates. Read more about Brent Bates. “Every person deserves the right to their own wellbeing regardless of their path in life,” says first-year Geisel student Louisa Chen. Her perspective on community medicine is grounded in deep sense of compassion that took root during her childhood. Chen’s family moved frequently, rarely settling in one country for long—Australia, China, then America. Wherever she lived, it was clear to her that one of the cruelest forms of injustice was health care disparity. As an undergraduate student at the University of California, Irvine, in Orange County where Chen discovered deep pockets of poverty within a county known for affluence—the veneer of wealth cloaking the evident social disparity. In this, she saw a need for not only free healthcare, but for a harm reduction program. As an undergraduate working alongside medical students, she initiated two ambitious projects to help the disadvantaged—Crescent Clinic and the Orange County Needle Exchange Program—projects that had power to change people’s lives. Crescent Clinic caters to the medically underserved, immigrant, and undocumented populations in Orange County. 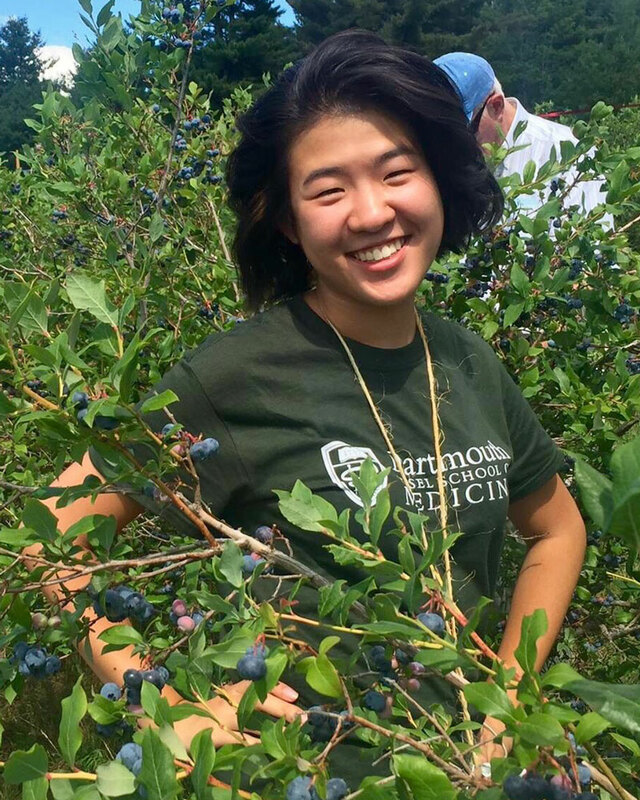 Over the course of her undergraduate years, Chen held many jobs, eventually managing the clinic, and she describes those years as one of the most defining and influential experiences of her life. She was particularly struck by the way the clinic’s volunteer doctors worked. “They weren’t there just to treat patients and prescribe them medication—they were there to listen to patients’ stories, advocate for them by helping them locate resources, and educate them so that they could have a chance at living a better life,” she says. “For me, the personal connection is more important than anything else. Being a doctor means making that same connection with my patients and empowering them to improve their lives,” she says. It’s the reason she chose Geisel. Read more about Louisa Chen.